Pro-unity politicians have been targets of harassment, and left-wing radicals have issued threatening messages against Supreme Court judge Pablo Llarena. The Spanish Interior Ministry has sent more bodyguards to protect judges and politicians in Catalonia, where there is an increasingly strained atmosphere in the wake of ousted leader Carles Puigdemont’s arrest in Germany last Sunday. Around 20 police officers will be charged with protecting members of the pro-unity Ciudadanos, Catalan Popular Party and Catalan Socialist Party. Security has also been increased around Barcelona judge Juan Antonio Ramírez Sunyer, who is in charge of part of the investigation into the illegal secession bid. Supreme Court Judge Pablo Llarena, who is heading the main inquiry, was already under protection following a harassment campaign by radical pro-independence groups. This new contingent will support the team of approximately 200 officers who currently provide personal security services in Catalonia, police sources said. Harassment of non-separatist public figures is not new, but has been growing. On October 3, two days after the independence referendum, dozens of people gathered in front of Ciudadanos’ headquarters in Barcelona, and several party leaders required bodyguards to leave the premises. Shortly before the snap election of December 21, dolls simulating shrouded bodies and bearing the acronyms of the pro-unity parties PSC, PP and C’s were hung from a bridge in Osona (Barcelona). Threats against Ramírez Sunyer were spray-painted in Port de la Selva (Girona), very near the spot where the investigative judge rents an apartment. 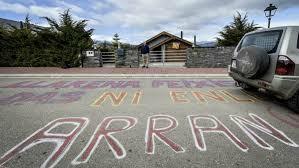 And in Das, a tiny hamlet in the Catalan Pyrenees where Judge Pablo Llarena owns a vacation home, someone singled out his house with the following message: “Llarena, fascist. Not in Das or anywhere else.” The message was signed by Arran, a far-left anti-establishment group with ties to the political party CUP, which has a small but determining presence in the Catalan parliament: its four deputies are essential to ensure a separatist majority, and their abstention at the last investiture debate prevented candidate Jordi Turull from becoming the new Catalan premier in the first round of voting. A local carpenter from Das, Pere Vidal, was the first to realize that the radicals had the wrong house to begin with. “I contacted the real owner and the media to let them know. I was afraid some idiot would show up to hurl fertilizer at the house or burn it down,” he said. The European arrest warrant that Supreme Court Judge Pablo Llarena sent German authorities accused ousted leader Carles Puigdemont of corruption, a fact that could speed up his extradition. In the Supreme Court’s written request to the German judiciary, which EL PAÍS has seen, Llarena equates misuse of public funds – which is not listed literally as such on a list of 30 crimes that may speed up extradition proceedings – with corruption. Puigdemont faces charges of rebellion and misuse of public funds in Spain in connection with the unilateral declaration of independence. On Wednesday, the National Police arrested three out of the four individuals who were traveling inside a car with ousted leader Carles Puigdemont when the latter was arrested in Germany. Two of them are members of the Catalan regional police force, Mossos d’Esquadra, who were on leave and acting as Puigdemont’s chauffeurs as a personal undertaking. The third is a historian, Josep Lluís Alay Rodríguez. All three have been released but face charges for aiding a fugitive from justice.